Rohit Shetty known for his over the top action scenes in the Golmaal series and Singham. Rohit Shetty also shared his expertise on how to direct action sequence. Watch this video where we take you behind the Scenes of Chennai Express. Ready or not…Daayan is coming… to HAUNT YOU!! Based on a real cult, ‘Ek Thi Daayan’ is an entertaining romantic horror thriller with an electrifying jolt at the end. Positively, among the most keenly awaited films of the new year, Ek Thi Daayan, marks the first ever association of two creative powerhouses — Ekta Kapoor and Vishal Bhardwaj. Directed by Kannan Iyer, film stars Emraan Hashmi, Kalki Koechlin, Konkona Sen Sharma and Huma Qureshi in lead roles. 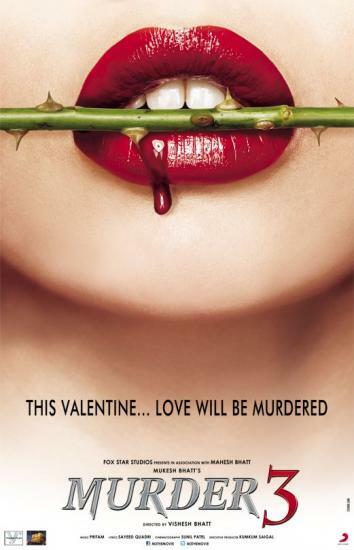 “This Valentine… Love will be Murdered” courtesy Murder 3. The Bhatt franchise Murder is all set to steal hearts away this Valentines. Featuring Randeep Hooda and Aditi Rao Hydari is the movie all about Love and Betrayal? Promo Posters Of Upcoming Movie Murder 3! Teaser poster of New year 2012’s Bollywood Movie Murder 3 – sequel to the 2011 film, Murder 2. Directed by Mukesh Bhatt and produced by Mahesh Bhatt, the film will release in February 15, 2013..This is the Third Installment in murder(film series). Randeep Hooda and Aditi Rao Hydari in lead role in Murder 3. ‘AkaashVani’ movie releases on 18th Jan 2013. The movie stars Kartik Tiwari and Nushrat Bharucha. Here is the first look poster of the movie AkaashVani. Check out the making of most awaited movie of 2012 “Dabangg 2” starring Salman Khan, Sonakshi Sinha and others, directed by Arbaaz Khan and is set to release on Dec 21, 2012. Here is the first look of Sudhir Mishra’s next film Inkaar.